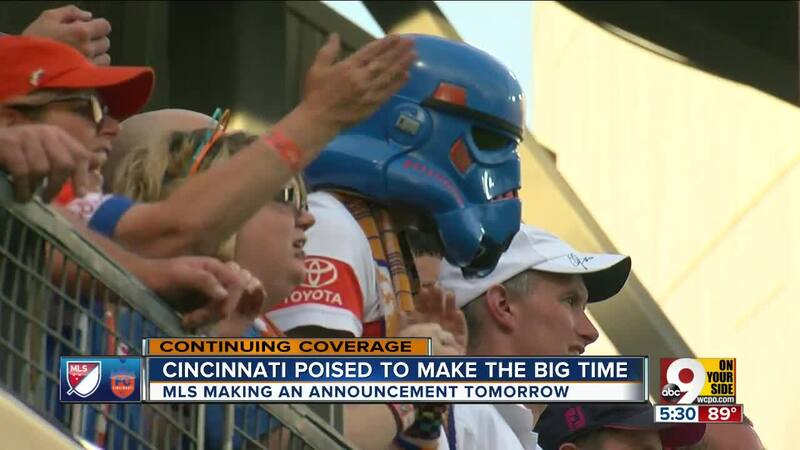 CINCINNATI – Soccer fans painted the town Orange and Blue on Tuesday to celebrate FC Cincinnati’s meteoric rise to become the Queen City’s third major league sports franchise. When Major League Soccer Commissioner Don Garber formally invited FC Cincinnati to join the league - in 2019, a year earlier than planned - huge crowds of fans erupted at the 5:30 p.m. announcement at Rhinegeist Brewery in Over-the-Rhine and at a watch party on Fountain Square. WATCH the announcement and the entire program at Rhinegeist in the video player above. Garber had high praise for the soccer club and its fans, especially the loudest, proudest FC Cincinnati fans from "The Bailey" who packed into the Rhinegeist tap room and cheered through the 45-minute celebration. 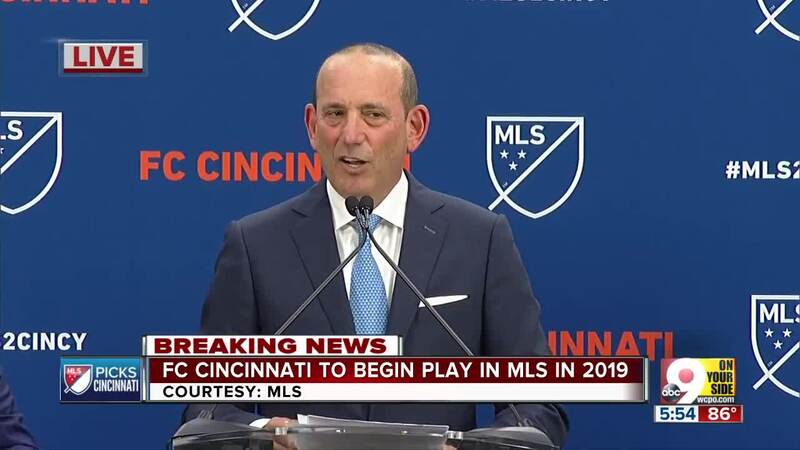 "You guys had me at ‘hello’ when I stepped off that plane 18 months ago," Garber said to Cincinnati. "To your incredible fans, you have shocked the world and shown us that if you have the right city and the right ownership and management and the ability to bring fans together, great things can happen, and the world has taken notice." Garber congratulated FC Cincinnati on its "incredible rise" from a third-tier minor-league team to the majors in just three seasons with record-setting attendance that surpassed most MLS clubs. He called this "a day I'll never forget" and challenged fans to make Cincinnati "one of the great soccer cities ... anywhere in the world." 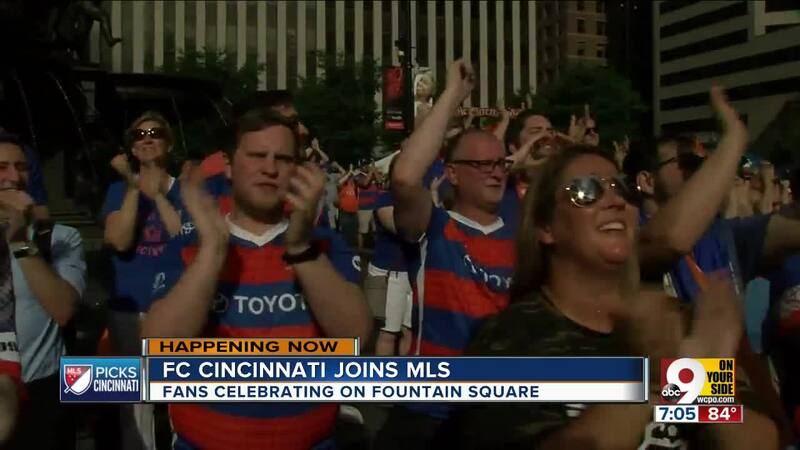 When it was over, Garber made a visit to Fountain Square with the mayor and FC Cincinnati's brass to thank the passionate and loud fans celebrating there. Thousands carried on for hours until the public after-party ended at 9 p.m. Speaking to WCPO after the announcement, Garber acknowledged that he and the league rejected FC Cincinnati's other choices for a stadium site, Oakley and Newport, leading to nearly six months' of hassling before the soccer club could win over the Cincinnati school board, West End residents and Cincinnati City Council and get a deal in the West End. FC Cincinnati and its fans are getting their cake and eating it, too, on an historic day for soccer and sports in the Queen City. While everyone knew the MLS invitation to become the league's 26th franchise was coming, the question left was whether FC Cincinnati would join next year or in 2020, when it was originally slotted. The league wanted one of its three incoming franchises to start play next year, and FC Cincinnati appeared better positioned than Nashville or Miami to do that. That should give FC Cincinnati competitive advantages in drafting and signing players over the other two clubs. The league said it will announce “during the coming months” whether FC Cincinnati will play in the Eastern or Western Conference. KEN BROO: Why the real work for FC Cincinnati is just beginning. Not everyone in town was celebrating, however. Before the event was over, an opposition group said it would seek a November referendum to prevent using hotel tax funds for infrastructure for the club's stadium in the West End. "FCC, you've won the battle but you have not won the war as of yet," said West End resident Contina Davis. RELATED: FC Cincinnati fans feel vindicated, opponents aggravated. FC Cincinnati announced a plan for buying season tickets for its 2019 debut season in MLS. Priority will be given to 2018 season-ticket holders. If you're not one of those, you can get priority by buying pro-rated 2018 season tickets through June 30. JOHN MATARESE: How much more will FC Cincinnati tickets, gear cost in MLS? Lindner also credited the fans for making FC Cincinnati not just a success but a phenomenon. "Because of you, our amazing supporters, FC Cincinnati has become an organic, region-wide movement that has added a refreshing new thread to our rising and growing urban core ... and a source of pride for all of us," Lindner said. Anxious fans started gathering outside Rhinegeist before noon eager for the announcement. 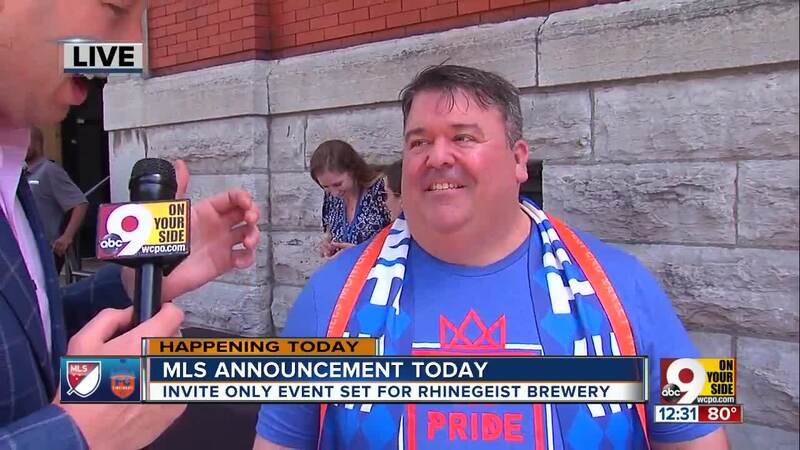 Dozens of members of FC Cincinnati's fan organizations - including Die Innenstadt, The Pride, The Legion, Queen City Firm and the Bailey Bast**ds - were invited to share in the festivities in the Rhinegeist tap room. They crowded in, standing on both sides of the stage, and made sure the celebration was a lot louder and more energized than the one in Nashville last December. The announcement began with introductions from ESPN soccer analysts Taylor Twellman and Adrian Healey. Garber and Lindner then took the stage along with Berding and Cranley. “This is a heady moment for a humble kid from the west side of Cincinnati,” Berding said, calling it “the next big thing for Cincinnati.” It was Berding who handled the long, tough negotiations so the club could build a $250 million soccer stadium project in the West End. "You know, it's appropriate that we're here today in a bar because it fits the identity of our club," Berding said. "We're accessible to everyone, where people come together ... We're not on some big mountaintop looking down. We're right down here literally in the valley of our city with everyone coming together, celebrating each other and celebrating our city. "When the task seemed insurmountable, I want all of you to know, I took great, great inspiration from you and everyone here ... We knew we were building a legacy future for our community and that inspired us and drove us to overcome any obstacles." Berding then welcomed Garber – popularly known by his Twitter handle, @TheSoccerDon - who brought the goods. The "crowning" of FC Cincinnati became official when Garber wrapped the team's scarf, the age-old traditional soccer symbol, around Lindner’s neck. Lindner said he was "excited to create a legacy that our community can enjoy for generations to come." "FC Cincinnati is a portrait of this city - the pride, the passion, the love," Lindner said. After Lindner spoke, a two-minute video highlighted what Garber called the team's "meteoric rise" since its first season in 2016. Cranley then presented his proclamation to Lindner. That got a lukewarm response from the soccer crowd, especially since the baseball and football teams have had a run of losing seasons. Bengals running back Giovani Bernard attended the announcement wearing an FC Cincinnati shirt. The team issued a statement congratulating the soccer team. After Cranley came an MLS video welcoming FC Cincinnati to the league. The video included greetings from soccer legend David Beckham, owner of the new Miami team, and several of the league's top players. Now that the formal announcement is over, the focus can turn to building FC Cincinnati’s soccer stadium project on the present site of Stargel Stadium behind Taft High School, as well as a new $10 million Stargel Stadium, which the soccer club pledged to build first across the street for Taft and other Cincinnati Public Schools to use. The soccer club says it will pay the building costs for the new 21,000-seat stadium and the $150 million MLS franchise fee. The total cost to FC Cincinnati could reach nearly $400 million after payments in lieu of taxes to Cincinnati Public Schools and promises to West End community programs included in a community benefits agreement. The city, county and state are kicking in more than $50 million for infrastructure. Before the new West End stadium opens, likely in 2021, the soccer team plans to continue to play at Nippert Stadium, where it has thrilled its early fans and made thousands more since its first game in 2016. The flip side to Tuesday's feel-good story is this: A big roster turnover may be in store for next year because some current players won't be viewed as good enough for MLS. Who except Lindner and perhaps Aaron Kohlhepp could have predicted that it would take less than three years from the conception of the minor-league club to this? "I'll let you in on a little secret," Berding said on the stage at Rhinegeist, "this day was always the vision of Carl Lindner and me from the day that we began ... This was always the plan." It was Aug. 12, 2015, when Lindner revealed his plan to bring a team in the then third-tier United Soccer League here. Because the Cincinnati billionaire never does anything minor-league, it was clear, if not stated, that MLS was his goal. And he laid out a plan for accomplishing that. 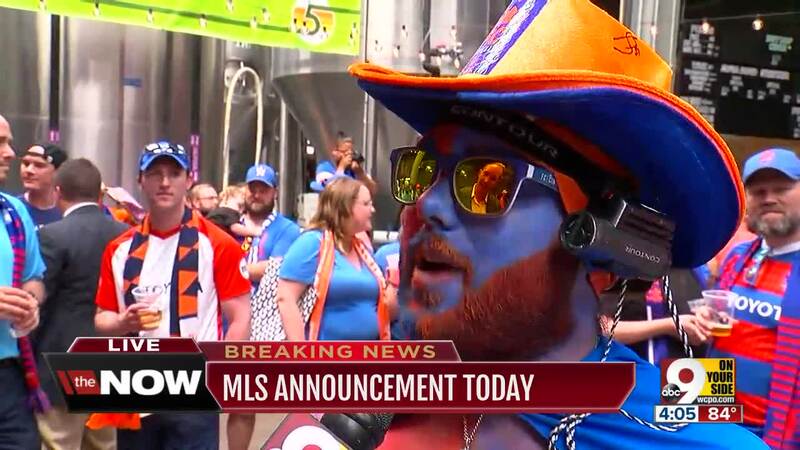 “Our goal for FC Cincinnati is to attract a passionate and loyal fan base with the best product on the field and the best experience in the stands,” Lindner said that on summer day 33 months ago. And that’s what just FC Cincinnati did. RELATED: Why didn't Cincinnati embrace previous pro soccer teams? The club immediately won the love and passion of a soccer-starved city with one of the largest per-capita populations of youth players in the U.S. And the fans helped sell Cincinnati as a soccer town to MLS, not only by buying tickets, but with their enthusiastic chanting, marching, flag waving and Orange-and-Blue smoke pots. In its first season, FC Cincinnati won international attention by selling out Nippert Stadium (35,061 soccer seats) for a friendly match with an English Premier League team, Crystal Palace. It was a record for a soccer game in Ohio. More national and international acclaim followed last year when FC Cincinnati beat two MLS teams to reach the semifinals in the U.S. Open Cup and drew three crowds of more than 30,000. Even for league games, FC Cincinnati attendance is regularly larger than at most MLS games. Along the way, Cincinnati has been proclaimed “Soccer City USA” by U.S.Soccer.com and won glowing praise from the national soccer media, including ESPN and Sports Illustrated. Are you wondering what Aaron Kohlhepp has to do with this? Kohlhepp was the original owner of Rhinehaus Sports Bar in Over-the-Rhine (not to be confused with Rhinegeist Brewery, a few blocks away). 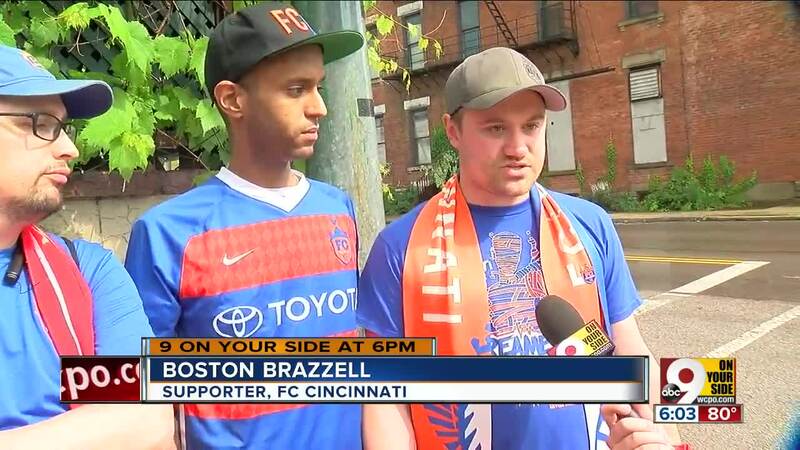 In a WCPO.com article in 2016, Kohlhepp said soccer fans packed his bar to watch FC Cincinnati’s very first game, a 1-0 loss at Charleston Battery. Kohlhepp said he knew FC Cincinnati would get a good following despite the crowded sports scene with the Reds, Bengals, Xavier and University of Cincinnati and the Tri-State's passion for high school sports. He said he opened Rhinehaus as a soccer bar three years earlier because he and his partners saw a niche for it. Kohlhepp said he saw a soccer community in Cincinnati that “has been here a long time and hasn’t had a lot to get behind. And soon Kohlhepp’s customers – and all Tri-State soccer fans - will be watching FC Cincinnati play each week against the top clubs in America. Welcome to the major leagues, Cincinnati.